"This will not be a book to be placed on the shelf and left there. I forsee this to be a much-used handbook, witten in, and peppered with dates of accomplishments both for dog and handler." "Matthew Duffy's love for dogs comes across so well though out this book. The idea of teaching manners first is brilliant. The exercises are very easy to understand, and I like that he gives 'what if the dog responds this way' scenarios. 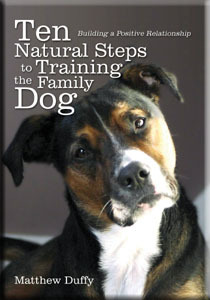 This book makes it obvious that he understands and highly respects a dog's natural behavior and that his goal is to strengthen the human-animal bond by teaching both the owner and the dog their roles to coexisting." The head of the average Family I deal with often falls short on enough time to comfortably manage all the aspects of pack living: too little time for the kids and spouse, even less time for himself or herself, and next to no time for the dog. In our amped-up American lifestyle, we have so much on our daily plate that there is little room left for any additional challenge, like owning a dog. How sad it would be to miss out on such a rewarding and ancient relationship. This has been my job over the past three decades: helping families minimize the challenge of dog ownership so that it fits on their daily plate. Honestly, with a few environmental controls and the right kind of relationship development, anyone who wishes can enjoy a canine companion as the first breeders intended: an animal uniquely developed to live among people. This purchase comes with a nonconditional 60-day money back gaurantee. If for any reason you are not happy with your purchase we will refunded back the $19.95. eBook (PDF) Also Compatible with Ibooks on Ipad, Itouch, Iphone, or any device that runs Ibooks.